Development Administration has played a critical role both in improving citizens’ life and in restoring legitimacy of the administrative systems in developing countries. Conceptually development administration is viewed as development of administration and administration of development. While the former refers to developing the administrative capacities or strengthening caliber and competence of development administrators, the latter implies execution of development policies, programmes and projects of the government. In the age of liberalization, privatization and globalization, development administration was found inadequate to serve the purpose of governments. New variants of development administration were evolved in developing countries to meet the exigencies of time. 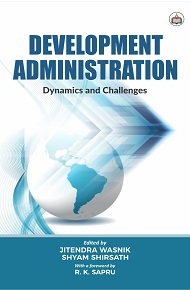 This book is a modest attempt to bring together the old and new forms of development administration. The contributions included in this volume are diverse, empirically grounded and illuminate many dimensions of development administration in contemporary India, Sri Lanka and Nigeria. It takes stock of the challenges before development administration and suggests ways to overcome them. We hope this volume would prove beneficial to students, scholars and practitioners of both public administration and political science. Jitendra Wasnik is Assistant Professor in the Department of Public Administration and Local Self Government, Rashtrasant Tukdoji Maharaj Nagpur University, Nagpur. Besides his 15 years of teaching experience at post-graduate levels, he has two books, many articles, book chapters and published papers in reputed journals. His areas of interest are panchayati raj, development administration, administrative thoughts and social governance. Shyam Shirsath is Principal of Vivekanand Arts, Sardar Dalip Singh Commerce and Science College, Aurangabad. He has worked as a Professor in the department of Public Administration, Dr. Babasaheb Ambedkar Marathwada University, Aurangabad and has been teaching since last seventeen years. He has published fifteen books and dozens of research papers in the field of Public Administration. Apart from all he has visited countries like Nepal, Sri Lanka, Bangladesh as a research tour and visited China as a part of Indian think tank delegation in 2017.